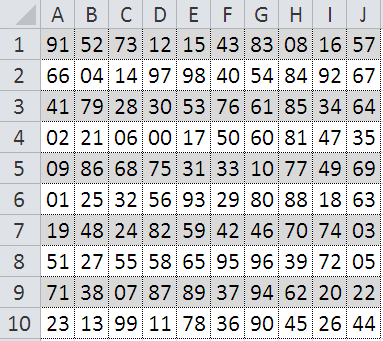 Inspired by a recent query at one of the Excel forums I occasionally visit, I would like to share a formula-based solution for the task of generating an nxn grid of random integers, where each of those integers is unique within that range. where I have formatted the cells in this range as custom type: 00 (applying a TEXT function to the formula would complicate matters, in the sense that this would interfere with the functioning of our FREQUENCY construction). 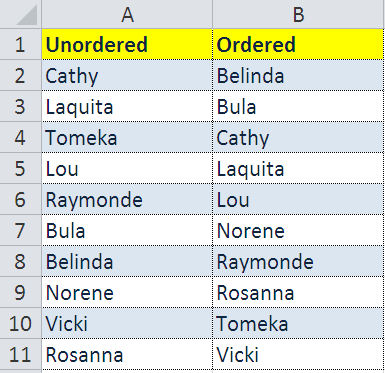 In this post I would like to present a formula-based solution which returns an alphabetically-sorted list of the entries from a given range. Effectively, then, the formula gives equivalent results to those obtained using the in-built sort feature (though which, for whatever reasons, we may not be in a position to use). For example, given the unsorted list in A2:A11 as below, we will return the ordered results as given in B2:B11.